One of the saddest moments in any Pixar film is Jessie’s song “When Somebody Loved Me” from Toy Story 2, a heart-wrenching lament about being left behind by her owner. 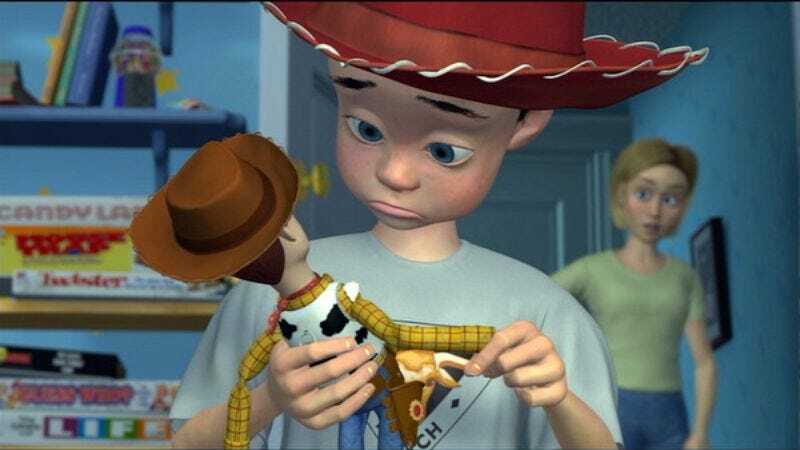 The films never delve into the owner’s identity, only using Jessie’s sadness as the anchor to keep Woody in place, and again in Toy Story 3 when everyone is afraid of going somewhere new. But Jon Negroni, the man behind the grand unified theory of the Pixar universe, has his own theory about the mysterious identity of Jessie’s owner. Using some contextual costuming clues—specifically how Andy’s red cowboy hat with white trim doesn’t match Woody’s—Negroni posits that it’s possible Andy’s mom is Emily, the girl who once owned Jessie. It’s a long shot, but one that actually has support from within the films. Toy Story 2 never reveals Emily’s last name, and Andy’s mom never gets a first name. And it would certainly help explain why Andy’s favorite toy—once described in the films as an old family toy—had its heyday back when a black and white children’s television show was on the air.